so that I may search for it in another store. I searched a lot of sites today and was very fortunate that your site came up- that is the exact swan that I am looking for. I’ve looked around & found another piece just like mine. Not sure how much you were looking to spend, but if you email me, I could possibly pick it up for you & ship it out. 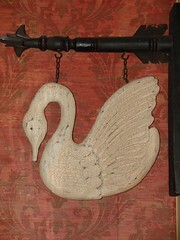 Hi, I was looking at the post hanger you have on this website with the swan posted on 11-10-06 I have this hanger with many different hangings but I can’t find who makes them or how I can finish the collection. My local store doesn’t get too many in and I’ve been collecting them for a year now. Do you have any information on who makes it or where I can buy them? I have several of the hangings, flag, snowman, bunny, etc., but I purchased them from a shop in Va., and have since moved. Is there anywhere I can purchase them on-line? Here’s a website that I found MANY different seasonal flags to choose from.